SVS PRESS - Seminary alumnus the Very Reverend Protopresbyter Stavrophor Nikola Ceko (M.Div. ’85) was honored Sunday, June 28, 2015, when the newest children’s book published by St. Vladimir’s Seminary Press (SVS Press)—Saint Nicholas and the Nine Gold Coins—was formally dedicated to him. Father Nicholas was presented with the freshly printed book at a special ceremony in the fellowship hall of St. Steven’s Serbian Orthodox Cathedral, Alhambra, CA, where “Fr. Nick” has been the Dean since 1994. “According to the Holy Fathers of the Orthodox Church,” Dr. Gerich continued, “our gifts are meant to be used for the benefit of others, which, according to the Church’s teaching, turns them into virtues, which is the ‘entrance fee’ into heaven—and this is what our Fr. Nick has spent his life doing for us.” Archpriest Chad Hatfield, chancellor/CEO of St. Vladimir’s Seminary, presented Fr. Nick Fr. Nick CekoFr. Nick Cekowith beautifully framed artwork depicting the cover of the children’s book. 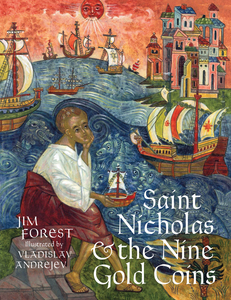 He remarked, "This book by Jim Forest has been illustrated by iconographer Vladislav Andreyev, who also illustrated our press’s Saint George and the Dragon book, which won the ‘Moonbeam Spirit Award for Preservation’ for children's literature."